The maximum accumulation of Jump Fatigue (blue timer) has been reduced from 4 days to 5 hours. New Chat Backend. See more information in this dev blog. Constellation and region channels have been removed. Player created chat channels are now always in immediate mode (all members are shown in the member list), without any member limit. Operators of chat channels can no longer add further operators, change the password, or change the mode of the chat channel. Only the channel owner is now allowed to do those things. Removed the option to specify a recruitment channel for corp recruitment adverts. Please use a link in the description, if you want to add a recruitment channel. Nanite Repair Paste may now be placed into ammo holds. Various under the hood graphics engine optimizations and refactoring to optimize for upcoming improvements and changes to the visuals of the game. We have renovated the next set of graphical assets found in deadspace areas and missions, giving them the latest V5 shader treatment. Expired the Guardian's Gala Cerebral Accelerators. When a player initiates a private conversation with another player, the recipient will now only see the private conversation chat tab after a message has been sent. This should drastically reduce the number of accidental conversations. Added the Marshal to Project Discovery rewards. Granted the Marshal to those players who have passed the required level in Project Discovery. Accounts that are under restrictions preventing trading characters due to prior rulebreaking are now also prevented from extracting skillpoints. 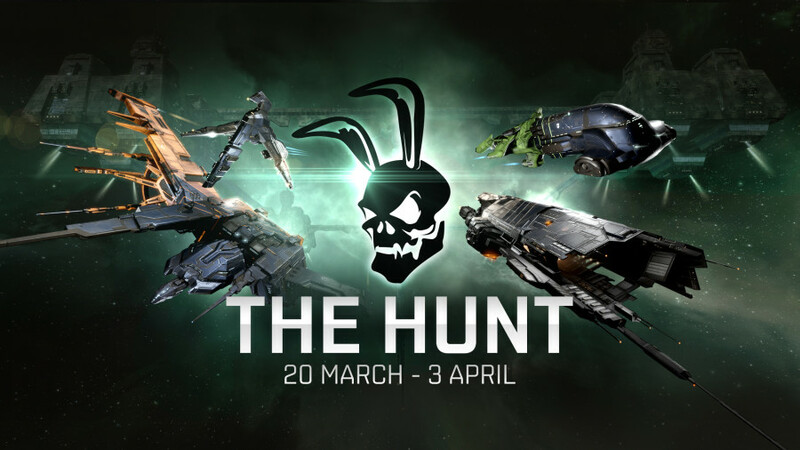 Added The Hunt Live Event, running from 20/03 until 03/04. Introducing the Monitor-class Flag Cruiser, from the CDIA division of CONCORD. Select T2 materials are required as build inputs and the BPCs can be sourced from the CONCORD LP stores. Shuttles and Capsules now have a 90% reduction to effective distance traveled for jump fatigue accrual. Following a cynosural jump, ships are delayed from tethering by 30 seconds. The tethering delay does NOT impact docking. This tethering delay applies to all cynosural jumps, including normal capital jumping, black ops jumping, and to ships being bridged (it does not affect the ship that opens up the bridge and stays at the origin point). The 30 second countdown begins once the ship loses its post-jump invulnerability (either by manually moving or after 60s). The ship's tether-block timer will be shown in the buff bar UI. The standard 30 second station undocking invulnerability now also applies to Upwell Structures. As with stations, this invulnerability is broken if a target is locked, a module is activated or any action is taken to move your ship. Added visual FX that are played on a structure when is it succesfully completes a repair cycle, or when it is successfully reinforced. Structures in Low Power mode will now display reduced docking traffic, exteriors lights, and holograms. Added a '?' icon next to the standing value in the Standings section of the Character Sheet. Hovering this will now show the tooltip for Standings. Added the Standings tooltip when hovering all entries in the Faction/Corporation/Agent section of the Standings tab in the Character Sheet. The Show Info window for a solarsystem now has a special tab for structures in the system. Please note that like before, it only lists those structures you have docking access at. Added a "Open Jump Navigation" option when right clicking on the Ship HUD of a jump capable ship. The selected item window and jump shortcut now work for Jump Bridges. Fighters can now be repackaged. When switching ammo types, charges will now always be placed into an existing stack of the same ammo type where possible. Fixed an issue where applying a corporate insurance contract to a ship with an existing insurance policy would lead to the cost being paid, refunded and paid again. Fixed an issue where the "Federation Navy Sensor Booster" had a 10 second reload time instead of 0. Adjusted the distance at which the Osprey hull model switches level of detail. Fixed an issue that could lead to rendering issues in character customization screen. Corrected an issue with floating damage locations on the Mobile Cynosural Inhibitor. Fixed an issue where the Medium Jump Drive visual effect could clip through some ships. NPE: Changed some of the text in the first industry career mission so that it is clearer for new players. NPE: Fixed the mission text for Gallente Advanced Military 7 of 10 so that it no longer references the Drones skillbook as a reward. NPE: Fixed mission texts for Career Military 5 of 10 so that it is the same for all 4 empires. NPE: A passkey issue with the acceleration gate in the 5th exploration career mission has been fixed. The passkey itself has also been renamed so that it is clearer what it is when viewed in the default inventory view (where its name is often truncated). Fixed an issue with the level 5 mission "Lights Out" so that it cannot be broken with high one-shot DPS. Fixed a mission completion issue in the Unauthorized Military Presence mission. Fixed mission text in Advanced Military 4 of 10 so that it no longer mentions "remote ECCM". Fixed grammar issues in various mission texts. Fixed a completion issue in the 'Gate to Nowhere' and 'Minmatar Plot (1 of 3)' missions, and re-enabled the missions. The jobs tab of the industry window will now display a loading icon when necessary. Ice Harvesting Drone II Blueprints and Moon Ore Mining Crystals II Blueprints now will correctly appear under Tech II. Contracts located in unanchored or destroyed Upwell structures are now cancelled correctly. Fixed an issue where Decommissioning an Upwell Structure while docked in an NPC station would fail. Fixed the contextual menu when choosing what cargohold to track so that the list of trackable bays is properly alphabetized. Fixed alignment of icons in Tutorial Videos panel. Fixed an issue causing duplicate confirmation windows to appear when changing UI scaling. Fixed incorrect sizing of hovered empire seals in Empire Selection view after transitioning from windowed to full screen client. Removed the SKINs filter category under accessories for item filters. Fixed an issue where the inventory window would open if a corp office is rented or unrented. When a kill right against you has its availability changed, its display in your character sheet now updates & you receive a notification about this straight away instead of after relogging. Improved clarity of attributes (Capacitor Need Bonus) for High Speed Maneuvering and implants using this skill. Fixed an issue where there was no difference between the "Set Name" options for an Upwell Structure or a jump clone when right clicking on an existing jump clone in the Character tab of the Character Sheet. Mining Upgrade skill and implants now display the CPU Penalty Reduction bonus in the Attributes tab. Fixed an issue where tags on brackets in space could become fixed at a single point on the UI. The "Too many Blueprints to display" message is now correctly shown at 25k blueprints not 10k. Added Arkonor ore in the description of Mexallon. The state column in the Structure Browser now shows an icon and tooltip for anchoring structures. Stacks of drones in a ships drone bay are now correctly counted when calculating the estimated value of a ship. Selecting "Simulate Ship" from a show info window of your own ship now correctly simulates its current fit instead of only the hull. The tooltips for fitted rigs no longer incorrectly refers to them as modules. Fixed an issue where the 'Subsystem Hold Capacity' tooltip for T3 Cruisers was referring to 'corpses', instead of 'subsystems'. Corrected the spelling of Exequror in its description. It¡¦s really a great and useful piece of info. I¡¦m glad that you simply shared this helpful info with us. Please keep us up to date like this. Thank you for sharing.